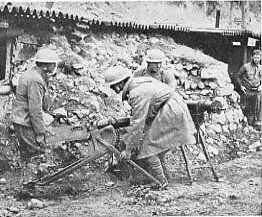 Also known to historians as the Second Battle of the Marne, the Aisne-Marne Offensive began on July 18, 1918 with a combined French and American attack on the German forces (7th Army) inside the St. Mihiel Salient. 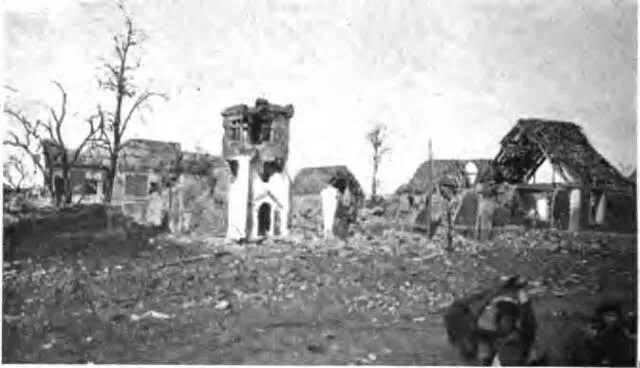 The 52nd Infantry Brigade attacked along the 26th Division’s line from Bouresches to the left of the Division sector. The 52nd Brigade’s initial objective was to take the Torcy-Belleau-Givry Railroad from Givry to Bouresches. 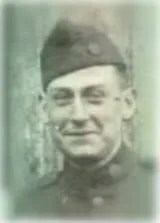 That night, the 103rd was forced to fall back to Belleau Wood by heavy enemy artillery fire and infantry counter-attack. The regiment remained in position the next day under heavy German artillery and machine gun fire before resuming the attack on July 20 and reaching its objective of Hill #190 on the Entrepilly Height (Point C), capturing many of the 200 prisoners taken by the 26th Division. The advance continued on July 21 as the German Army fell back across a broad front in a general retreat. The 103rd Infantry moved through Sacerie Wood and Sacerie Farm towards Trugny where it again encountered stiff German resistance along the “Berta Line” in the area of Epieds (Point D), which included orders for enemy artillery to contaminate the front line with mixed gas of all types. 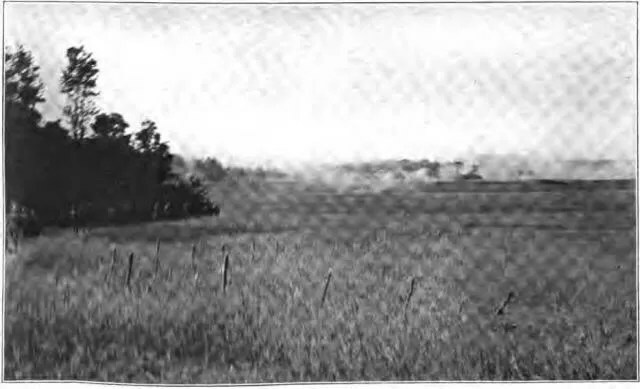 On July 22 the entire 52nd Brigade attacked Epieds twice only to be pushed back both times with heavy casualties from German machine gun fire. 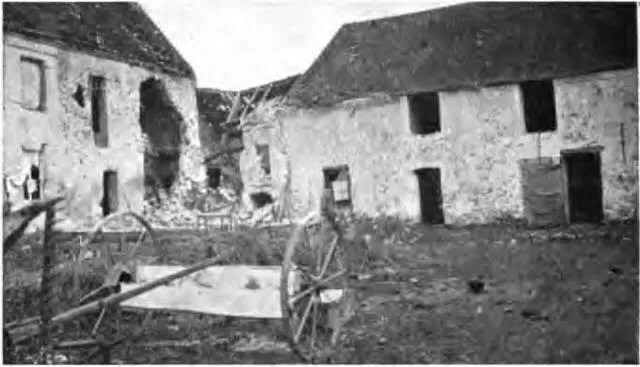 Overnight more than 1,000 artillery shells fell on the 52nd Brigade’s Command Post and the next day the 52nd was again repulsed in a third attack against Epieds, the vigorous defense of which proved to be merely a rear-guard holding action by the enemy while the main German forces withdrew. By July 24, 1918 the German withdrawal from Epieds was complete and the town was finally taken. 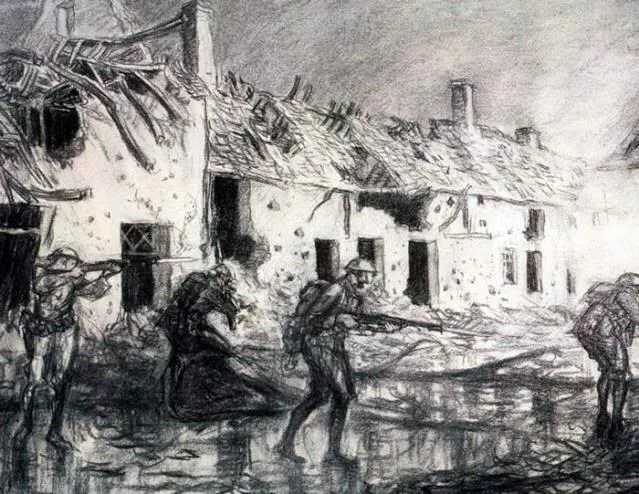 The battered 52nd Brigade was relieved and withdrew to the vicinity of Etrepilly west of the Chateau Thierry-Soissons highway, greatly reduced in its effective strength. After a 3-day march the 52nd Brigade was billeted in the vicinity of La Ferte-sous-Jouarre with Division HQ established at Mery-sur-Marne. ORIGINAL FILM OF US 103RD INF. TROOPS JUMPING OFF FOR TORCY, FRANCE ON JULY 18, 1918. Read Soldier’s Mail during July, 1918 here. The Division Commander takes great pleasure in citing in orders the following named officers and men who have shown marked gallantry and meritorious service in the capture of Torcy, Belleau, Givry, Bouresches Woods, Rochet Woods, Hill 190 overlooking Chateau Thierry, Etripilly, Bezuet, Epieds, Trugny and La Fere Woods to the Jaulgonne-Fere-en-Tardenois Road during the advance of this division against the enemy from July 18th to 25th, 1918 in the Second Battle of the Marne. I went to the Anne Marne American Cemetery yesterday and it was CRAZZZZZZZZZZZZZZZZZZZZZZZZZZZZZZZYY!!! I learned so much awesome stuff from the people there. There were over 2,800 American solidiers buried there. We stood on “No-Mans Land” and learned the untold history of the American Marines. You’ll go into the trenches, and see where we fought for France. I reccomend going there! Yesterday we came to the cemetery with our school, I found it really interessting how we got to see how the people fought in world war one. I really liked going to the chapel I thought it was really interessting how we can see a lot of names on the walls, and also the cemetery part where all the crosses were. And the story about the young soldier going to war at the age of 17, who died little after. The wood were pretty interessting as well, that we saw canons that were used 100 years ago. All the american flagswere really nice. Yesterday we visited the american cemitery in Aisne Marne. I realy enjoyed it going through the battle field and seeing the trenchs, foxholes, and bomb craters. I learned that over 2800 soliders were buried there. Dear website, yesterday my class and I went to visit the american cemetery of Aisne-Marne.We were on no-man’s land and saw the holes caused by shells,we tried to picture the war during the war.We saw the bullets in the trees and the armory which was used back then.We entered the church were we saw the list of all the names which didn’t have bodies.We were told one story about the soldier and we had to pay a moment of silence.It was a wonderful expirience. Yesterday i visited the american cemetery in Aisne Marne. I learned how hard it was to be an american soldier especially when you lied about your age just so that you can fight for your country and be a hero. I saw the german artillery that was used to kill the american army. I saw the symbols that were used to show that the soldier’s body was found recently. I saw the bomb craters and the trenches but they weren’t very deep because of the leaves that covered them. There was a lot of mud in the battlefield and a lot of trees were damaged and still trying to recover from the damage done almost a hundred years ago. Yesterday my class and I visited Aisne-Marne american cemetery. I learned a whole lot of information that interested me. I learned that jewish soldiers had their gravestone with the Star of David on top and and I also started to understand why these marines and soldiers decided to go and fight. We visited each grave in silence with the class and we realised that soldiers of all ages and all ranks died and were buried with the same tomb stone. We saw the ruins of the war battle field. We saw trenches, fox holes, and bomb craters. There was also a church that had the names of over a thousand american soldiers that their bodies have not been found. This was a great tour and I can’t wait till our new field trip. Yesterday I and the rest of the eighth graders went to the American cemetery which is located right next to the Belleau woods. When I went to the small chapel, I saw over 1,000 missing soldiers’ names listed on the wall and only 4 of them were found. The story of a young boy who fought at the war and died at the age of 17 was shocking and very depressing. 17-year-old isn’t that much older than my age. At the end, we had a minute of silence commemorating the bravery of the soldiers who fought and died at the war. I’d like to go there again with my family once again to tell my family the sad incident caused by World War I. Yesterday my class and I traveled to the Aisne-Marne cemetery. Although the Great War occured almost a cenury ago, the thousands upon thousands of losses of American soldiers loomed heavily upon me. I learned that over 2,000 Americans rested in this very cemetery! It was a treat to be able to visit the Belleau Wood, the very place where a battle occured! We visited the chapel, saw trenches, foxholes, and bomb craters, and solemnly strided through the many rows of white crosses and Star of Davids. It was quie amazing to see trees with shrapnel in them and the dent in the chapel, and the war almost came alive for everyone, I think. Although many soldiers went missing or are unknown, we will never forget the honor that they are owed by America and Europe. Yesterday I visited the Aisne Marne cemetery with my class. We walked through the cemetery, visited fox holes in the forest and visited the chapel. I learnt many new things such as that there are not only Americans buried there, including Jewish Americans, one Canadian, and other Americans with different origins such as Italian. We also were able to see actual cannons with real bullet holes. I liked the fact that the Germans called the American Marines “Devil Dogs” because of the blood red look their eyes had when wearing the gas mask. In all I really enjoyed my visit. Yesterday the rest of the 8th grade and I (from Marymount, Paris) went to Aisne Marne American Cemetery. We had two tours, both outside and inside. Each lasted about 45 min. I learned a lot of interesting information that I wouldn’t other wise have known. One of the many facts that I learned was that the American soldiers dug out holes in the ground (on the battlefield) called fox-holes. Sometimes the shells that exploded made fox-holes in them selves. I also learned that most of the soldiers who faught for America were actually from Europe and their families had migrated to the States. I also learned that over 1000 soldiers have not been found, but recently 4 bodies of the missing soldiers have been recovered. When we went in to the chapel (that honours the missing soldiers) the walls were almost completely covered by names. The battlefield was extremely muddy, but we enjoyed it never the less. We saw many cannons that had been shot or exploded, as well as the shell holes in the metal of the cannons. Over all I enjoyed the visit very much! Yesterday I went to the cemetery with my grade. We visited the chapel and went through the forest. The superintendent and his colleague guided us around. When we visited the cemetery we learned that a lot of the soldiers’ indentity were unknown so on their headstone was written “Here rests in honored glory an American soldier known but to God”. For Jewish soldiers their headstones were the shape of the Star of David instead of a cross. On the stained glass window of the chapel was a drawing of the symbols of the different districts. We even heard a story of a young man who thought the war was something exciting and when he realized it was the complete opposite, it was too late. I felt sorry when I thought about the thousands of other soldiers who went to war just like the young man and lost their lives when they thought they could back by Christmas alive to their family. Yesterday, my class and I, went to visit the Aisne Marne American Cementry. We took a tour of the Belleauwood where the battle occured. We saw the conditions in which the soldiers foght, the trenches they were in, the artillery they used and the tanks they shot bombs with, at the end of the visit of the Belleauwood we visited the chapel were all the names of the soldiers are engraved. There are over 1000 soldiers who were not found, 4 of them were first unknown and then found. After that we saw the tombs of soliers and also the diffrent tombs for the jewish americans. Yesterday I went with my class to the Aisne Marne cemetery and I have to say that it was very impressive all the soldiers that were found and all the soldiers that are missing and it total it was 2,800 soldiers buried. What impressed me the most is that there was this one grave that belonged to a 17 years old kid and when I think about it he is 3 years older than me and instead of him playing video games like me or watching TV like me he went to war. I can’t imagine how much he suffered. What impressed me the most was that inside the chapel the whole walls were full of names of soldiers that haven’t been found and it was over a 1,000 names. We went to the Aisne Marne cemetery yesterday, 8th grade had great fun in the woods at the place with the canons particularly the one that had been shot. We visited the chapel and the cemetery we sanded the tombs and had a minute of silence for one of the soldiers that died at the age of 17. With my school and I we went to the to the Aise Marne American Cemetary. Other there I visited the forest, and the cemeterery it was really interesting, because I learned that out of 100 percent 40 of the percent of the bodys were buried in the place they died. I also like visiting the chapel, and seeing the cannon it was really educational, and interesting. At Aisne-Marne with my class, I learned that about 40% out of the families who had a family member die while fighting in WW1 wanted their children buried in Europe instead of in the States. I enjoyed walking through the battlefield of Belleau Woods and seeing where the Germans and the Americans fought. By reading this text and journals, I learned that it was very difficult for the Allies to get the land back from the Germans. Also there were lots of deaths compared to the Germans. Yesterday I went to the American Cemetery in Aisne-Marne, and saw all these crosses. It is sad that so many people had to die to get this little land. We went to the american WW1 cemetery in Aisne-Marne. We had a great time and learned so much about the war. I never knew it took that long for the allies to take back the area.What I fould touching about the place was that we got to folded the flag and had a moment of silence for respect. On January 14th, my class went to Aisne-Marne to visit the American Cemetery.The chapel was very beautiful.I really like the statues of the outside wall of the chapel. Those statues show the technology for the war.There were very young soldiers.The average age for a the soldiers was seventeen to twenty.In the American Cemetery there were 2,800 soldiers who died and 1,056 unknow soldiers. Yesterday, January 13 2011, My class and I went to visit the Aisne-Marne American cemetery. I need to say that it was a trip that helped me picture the moment. Something that really touched me was how many tomb stones there were. I always knew that there were a lot of people who died, but actually seeing it surprised me the most. Also seeing the canons all full of holes was frightening Especially when Mr.David told us that there were the soldiers behind that, it was like WOW! I really enjoyed yesterday’s field trip and I thought it was a very beautiful place. On January 13th 2011,I visited the Aisne-Marne Cemetry. When I went, there were many things that I found interesting and even things that I never knew! One thing that I learnt was that some soldiers were never found and were determined to be Missing. When this occured, their name was engraved on the Missing wall. 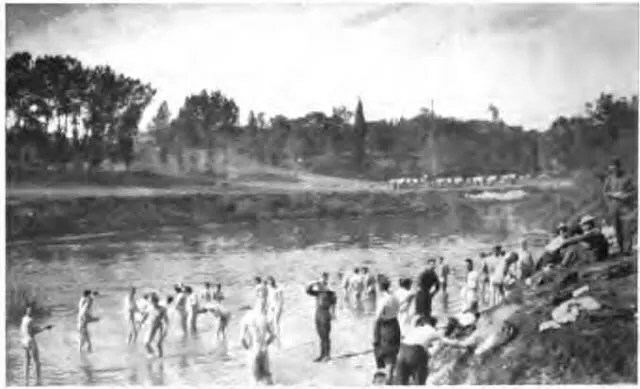 On the other hand, some bodies were found but they were so fragile that it was impossible to identify them. On their gravestone, they were identified as Known Only to God. A very interesting person that I learnt about was a young boy. This boy and his friends really wanted to go to war, but did not pass the age limit. Therefore, they lied about their age to take part. In the end, this young boy died at 17 and said that he regretted his descision so much. I also learnt several facts during my visit. It took Germany 3 days to cover 50 kilometers, whereas it took the allies 20 days to get it back. My visit yesterday was just extraordinary and truly beautiful. It is something that was not only a phyisical beauty but it was the emotion and honor that the cemetry had which was just amazing. On January 14th, the eighth grade class of Marymount Paris was fortunate enough to visit the Aisne Marne American Cemetery. When we arrived we saw a tall chapel centered in between two sections of the cemetery. The chapel was inscribed with 1,060 names of all of the soldiers that were missing and never found during World War 1. Out of those 1,060 names, only four were found. A small star was placed beside their name on the wall for the recognition of recieving their identities again. We also recieved a tour of Belleau Woods which is behind the cemetery. in these muddy woods, the largest number of soldiers died. There are many craters left in the ground from the various bombs and there are cannons that stand in the woods as well. It was a great and educational experience to see Aisne Marne American Cemetery. Aisne-Marne is an American cemetery where the soldiers of World War one were burried. There are a total of 2289 soldiers, although they are only 40 percent of all the soldiers. The other 60 percent were sent back to the United States. World War 1 was the first time important technoligical advances were used. It was the first time where gas was used, the first time when tanks were used, and the first time when there was an airforce. 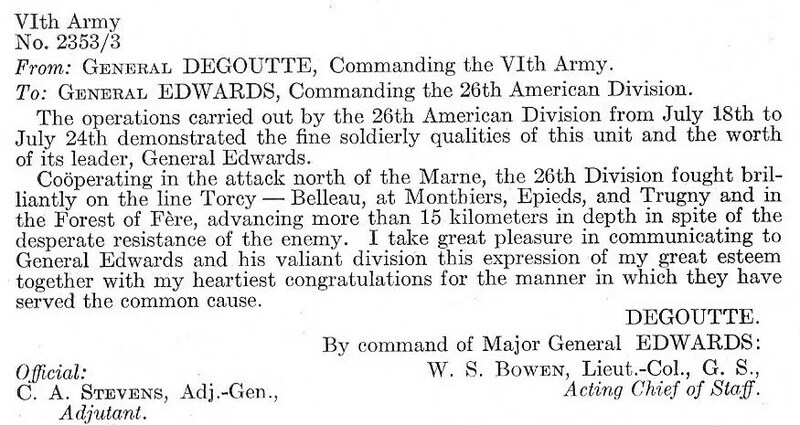 Aisne-Marne is important for American marines, because the number of marines who died in Belleau Wood, were more than in any other war all together. Aisne-Marne is an amazing place where you can learn about World War 1 in a more detailed way. By seing this place and especially ‘The Belleau Wood’, I understood the importance of the place. I could immagine the events that happened in this wood,which is sacred place for the marins. The guide even referred to the wood as a a pilgrimage place for the marins. Seeing the number of people that died for America I can’t even immage the courage those men had. 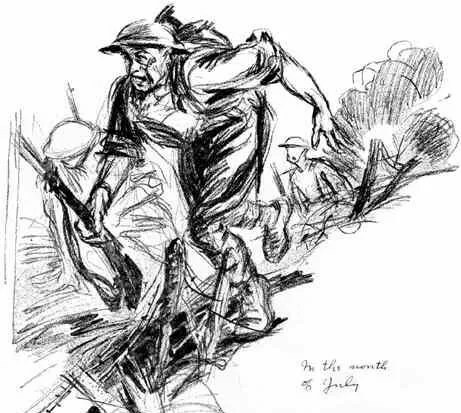 There were horrible effects when there was a machine gun emplacent facing an open field, soldiers would charged towards the enemy at the end of the field as fast as they could wielding a bayonet. Alot of men died quickly in a small radius. Around 2000 men were burried in Aisne Marnes Cemetery, and 1000 were missing. I have my great-grandfather’s discharge papers from the 103 Infantry that list his wounds received in service: “G.S.W. both ankles, Belleau Woods July 20, 1918.” It was from machine gun fire. I remember him telling us about tying his boot laces below his knees to slow the blood flow. Thank you for creating this site, it has really given me a more real idea of what he went through. Thank you so much for assembling this article! Both of my grandfather’s were there on the days of this offensive. Their names were Ivan Glynn and Edward Blouin, both with the 26th Division out of New England. 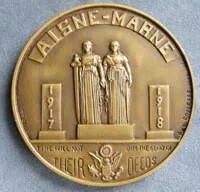 Thank You for publishing this incredible article, i was researching this commemorative medal i have dated 1917-1918 about this cemetary, somebody out there must want this medal as i can only remember my uncles serving in wwII, korean war and vietnam. My mothers uncle Ole O Romslo died of wounds July 28, 1918 after the fights with Ourcq river. He served in the Rainbow Division in 167th Infantry Brigade. To read about the heroic efforts that these soldiers exhibited makes me humble and grateful.